Graciously moving through forests and mountains, a wild creature arrived. Astonished by its magnificence, the whole nature looked back. No one had ever seen anything quite like that. All the fuss was just because of its adornment that stood out from the crowd. It was its horns – as colourful as the life itself. 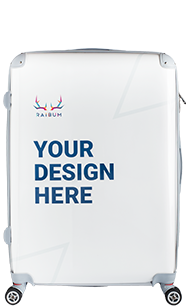 Quality of each RAIBUM suitcase is ensured by the high production standards and the tests carried out in practice while travelling almost half of the world. The push and pull handle, as well as the carrying handles are specifically adjusted to a human palm to create a more convenient grip. Zip fasteners are carefully sewn in and secured with a protective band. Besides, they can be interlocked with the TSA lock. The improved wheel technology ensures quiet handling and excellent manoeuvrability that releases your arms from extra load. 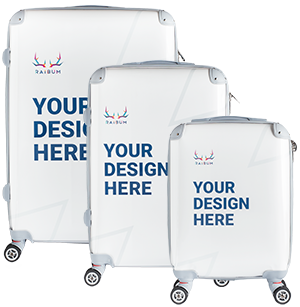 You will receive the suitcase with a protective packaging that reduces the impact of external environment and provides a more secure storage of the suitcase when not in use. There are 2 spacious compartments and smaller pockets, as well as safety belts for securing the carriage. This luggage security system exists in hundreds of airports all over the world. 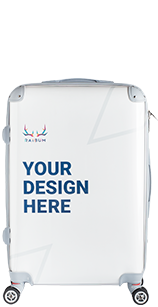 Built-in TSA lock comprises of 3-digit security code chosen by you and it protects the suitcase from damages in case of a security check. High impact resistance (300 kg/m2), UV-protection that will prevent the applied design from discoloration, as well as -40 °C to +130 °C high temperature resistance. - with delivery to Europe - from 32 EUR.